Over the past few months I’ve been working on my holy grail: Healthy macaroni and cheese. Swapping the pasta for 100% whole wheat is a given. The real challenge is reducing the saturated fat and sodium while keeping the savory deliciousness of a great mac ‘n’ cheese. Instead of using low-fat cheese (or even less cheese), I wanted to see if I could do it without any cheese at all — but I’m not making it vegan, either. There are already a handful of good vegan mac and cheese recipes out there, and besides, it’s more fun to reinvent the wheel. The best I can hope for is that my version will satisfy the craving for a big ol’ plate of my friend Emily’s amazing full-fat (full-everything!) Mac’n’Cheese. So far, this recipe comes pretty close to achieving that. It tastes good… but it still isn’t quite macaroni and cheese. which helps give it a cheesy, nutty flavor, along with some B vitamins. I also sneak in cauliflower for bonus nutritional benefit, and I particularly love serving it with a side of stewed tomatoes (also stolen from Emily’s playbook — thanks, Em!). Have any ideas on how to improve this recipe? Please share in the comments! 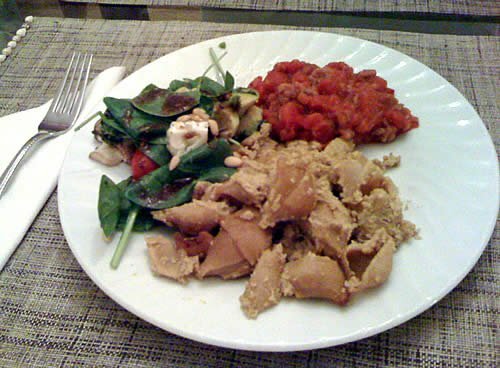 I add Nutritional Yeast which helps give it a cheesy, nutty flavor, along with some B vitamins. I also sneak in cauliflower for bonus nutritional benefit, and I particularly love serving it with a side of stewed tomatoes. Boil the pasta until it is al dente. While that’s cooking, steam 3/4 head of cauliflower until soft (about 10-15 minutes), saving the water in the bottom of the pot. Allow the cauliflower to cool a bit, then add all the ingredients, except the pasta, to a blender and purée until smooth, making a very thin sauce. 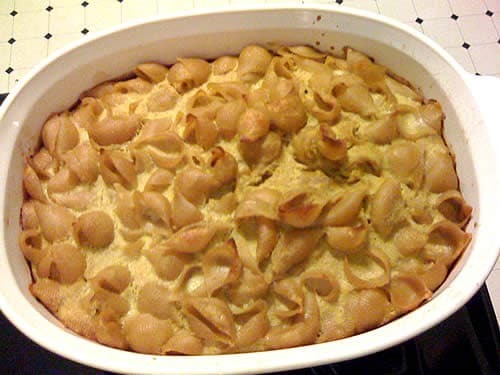 Layer the pasta and sauce together in a deep baking dish, stirring gently to be sure the pasta is completely covered. Bake, covered, at 375F for 30 minutes. Uncover and bake an additional 15 minutes. To check for doneness, and that the egg is cooked thoroughly, make sure it has firmed up in the center — if it’s still liquid, put it back in the oven for another 5-10 minutes. Heat all the ingredients in a saucepan, stirring frequently. Simmer for a couple minutes and serve. What is nutritional yeast and how does it differ from, well, yeast?? I made something sort of similar a while back using cauliflower instead of the pasta and puree’d cauliflower and cheese for the sauce instead of all the butter and milk. Not as healthy as yours but gluten free and incredible delish! One of the best ways to lower the fat is to make the sauce using a tin of tomatoes and 2 tsp flour. Blend with a stick or normal blender; season, transfer to a saucepan and stir until it comes to the boil. Or are tinned tomatoes considered too processed? If so, you could juice a kilo or so and use the juice to make the sauce….